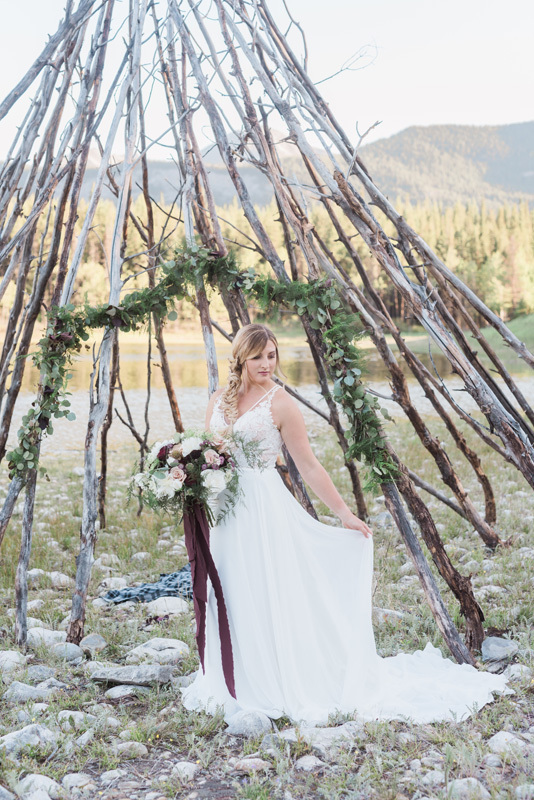 Did you see this gorgeous Rocky mountain photo shoot our team was lucky to be a part of? It was featured over on the beautiful Rocky Mountain bride and we're finally getting around to sharing the gorgeous photos on our own site. We always love collaborating with so many incredible artists and products - we are truly lucky in Alberta to have so many amazing people to work with when it comes to weddings! Mountain Beauties provided the hair and makeup for the shoot, creating a loose fish tail braid that gave the bride a bohemian style. We also tied in touches of the burgundy and deep colours used throughout the shoot in the bride's makeup. We love the natural beauty of this couple and all of the design elements our team created - we hope you love it too!